GABF 2014 Reflection: Competition With A Capital C! I recently had the honor and pleasure of judging at the GABF again this year. I have had a lot of brewers ask about the judging process and wonder what exactly happens to their beers when they are entered, so I thought it might be helpful to write a little about my experiences as a judge. After starting to attend the GABF as a brewer and entrant about 20 years ago, and beginning to judge at it a dozen years ago, the growth and changes What I have witnessed have been amazing. With about 5700 entries in the competition, even with 90 categories there are over 60 entries per category on average. The largest category, American India Pale Ale, had 279 entries. That’s a lot of beers to be competing against! With this many beers entered, there is no question that every beer that wins a medal is a top quality beer that deserves a medal. However, not every really good beer wins a medal, which can be frustrating to a lot of brewers making excellent beer. Have lots of people taste your beer, and train your tasters. Most categories have at least 3 rounds of tasting, usually with 9-12 beers in each flight for groups of 3 or 4 judges. The goal in each of the early rounds is to select the 3 best beers to pass forward to the next round. The easiest way to whittle down to those 3 is get rid of the beers with obvious flaws. Keep in mind that obvious flaws have a different threshold at a table full of judges than at a taproom, but also that different people, even trained tasters, have different taste thresholds for specific flavors. This is why it is critical to have multiple tasters provide feedback for your beer. You may be highly sensitive to diacetyl, and less so to DMS, for example, but if any one of the judges at a table picks up a significant flaw, that beer goes out. By the time any beer goes through 3 or 4 rounds of judging, it’s going to have to pass judges that are sensitive to anything, essentially. Want to give your tastebuds a workout? Head to the Food and Wine guide on how to become a better beer taster. Pay close attention to the style guidelines.Years ago, it was often thought that beers did better in competitions by being more dramatic, pushing the boundaries of styles, that just being stronger, hoppier and more intense would automatically make more of an impression. If that ever was true, it certainly isn’t any more. For one thing, there are so many more styles now, especially for stronger beers, that there really is no excuse for having an entry too big for its category. I saw number of entries rejected for being “too hoppy for the style,” so if the guidelines limit a given flavor to “low,” make sure your beer reflects that. That said, the guidelines don’t cover every conceivable combination of ingredients and process, and there can still be well balanced and enjoyable beers that don’t quite fit any of the styles well. There is no reason that every beer you make has to be for competition; just don’t expect an entry to do well in a traditional category unless it fits the description. Aside from avoiding mistakes and staying within the parameters, give the beers depth of flavor, balance and interest. There are more beers than ever before, and they are better than ever, too. This is the first year I have had multiple first round flights where every single beer (out of 10 or 11) was pretty good, and nothing was obviously sour, buttery or oxidized. Once a beer gets out of the first round, there is probably a couple more rounds to go through to get to medals, each time being compared to other beers that were among the best 3 in their flight. It used to be that entering a well made beer would almost guarantee getting passed into the second round at least, but I saw some first round flights where there really were more than 3 beers that were truly quite good. In order to stand out among a flight full of quality beers, beers do need layers of flavor. Even among light bodied styles, malt flavor can be smooth, crisp and apparent. Even in styles with low bitterness, multiple hop varieties and additions can provide complexity, freshness and depth. Use balance and nuance to make beers memorable. And of course, if you are lucky enough to be able to attend, give yourself the chance to taste a lot of other beers, see what other people are doing with new and traditional styles! It is a fun event with lots of learning opportunities as well. And if you do have suggestions for any changes to make in the festival itself, or specific style guidelines, let the Brewers Association know. We are privileged as an industry to have such a responsive professional organization to work with, so make sure you take advantage of that. Now that the Great American Beer Festival has come and gone, and excitement has died down, a reflection on the event has come! I’ve been lucky enough to be able to judge at the GABF about 6 or 7 times over the past dozen years, and have attended as an exhibiting brewer off and on for 20 years, and a lot has changed over that time. The most obvious from this year’s judging: the GABF is BIG!, in every sense of the word. Over 4800 beers judged, more than twice as many as a decade ago. We thought 2000 beers was a lot then, but now there’s also twice as many judges, over 200. The beers are big; the biggest category was American style IPAs, with over 250 entries. There are more categories every year, as experiments become trends and then full-fledged new American styles (Rye beers! Fresh hop beers! American-Belgo beers! Four different categories of barrel aged beers!) There is also a lot of speculation about how the ever expanding scope can be handled. Will the public tastings move from the Convention center to an even larger venue? 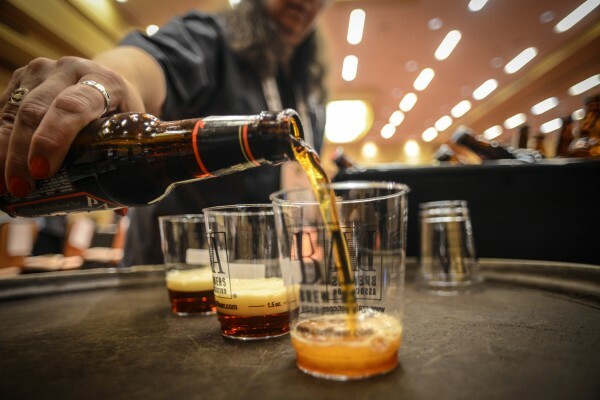 Could the judging be broken into regional qualifying rounds prior to the GABF? Another interesting thing I notice now is the shift in attitude of the international judges. Back in the early years of the festival, they helped lend credibility to America’s new fascination with the world’s favorite beverage. While the great Michael Jackson was always gracious and an enthusiastic supporter of the American Craft beer scene, many of the other European judges were rather dismissive of American attempts to mimic and modify traditional British, German, and Belgian styles. Now, the international judges feel honored to participate, and happily acknowledge the influence American craft beer has on energizing their own home beer markets. We have transformed from the little brother tagging along after the big kids to the winner everyone else wants to be. We have become the unquestioned world leader in beer quality, variety and innovation, now setting an aspirational standard for those countries we once hoped to emulate.